We Have Something to Say to YOU, Sara R and winglion! A scary diagnosis, a serious injury, a death in the family, caretaking a parent with Alzheimer's, living with cancer....all of it can feel lonely and isolating. In this online world of Daily Kos, though, we have genuine Healers named Sara R and winglion who fill that breach with something extraordinary: A Community Quilt. Any kossack who wishes to can have their own message of encouragement inscribed in archival ink onto a quilt, a message that can be read over and over again as the recipient wraps themselves in the love of their community. Try and imagine how that feels! 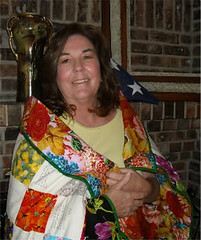 If you've ever received a quilt, as my husband paradise50 just has, you know how hard it is to express your gratitude. You are, after all, overwhelmed, afraid, or in pain. So I'm posting this diary not just to thank Sara R and winglion on behalf of paradise50, but also on behalf of others who have received these healing gifts of community care and concern. Sara and Ann, we want to say thank you as a community. We want everyone to know how amazing your healing work is. And we want to help you in return. Follow us below the orange gnocchi doodle to see some of these gorgeous quilts and see how you can help the sisters bring the same level of compassion to other of your fellow kossacks who are suffering. CLICK HERE to make ANY donation, no matter how small, to the Quilters to help with future Community Quilts. 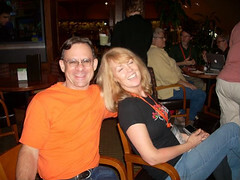 Last June at Netroots Nation paradise50 and I didn't have a care in the world. Five months later he discovered a hard swollen gland in his neck. In January it was diagnosed as HPV positive throat cancer, and this healthy athletic man was suddenly facing surgery, intense radiation, and chemotherapy. Being very private people we were reluctant to talk about this online, but people noticed the silence and became worried. Once we opened up the response was overwhelmingly positive, kind, and caring. 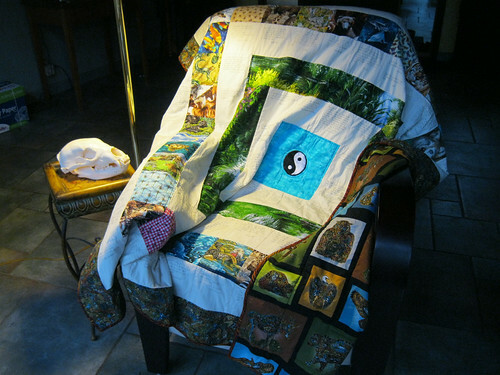 And when Sara R heard, she posted a Community Quilt diary where paradise50 could tell his story, describe his upcoming treatments, and share his fears. What I've learned by learning to be more public about private matters is that, first and foremost, people care. Even people who don't know you very well. Second, people want to help. There aren't many ways in this culture for people to tangibly express their sadness for you or their hopes for your recovery, especially when they're at a distance and can't bring you food or flowers. Words and images on a screen are comforting, but fleeting. But....look at the images below. 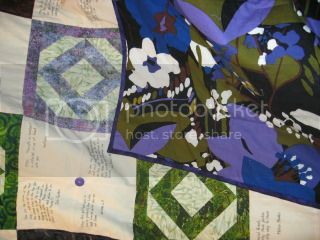 Each person who wrote a message of hope or encouragement or poetry or prayer was able to make a small donation ($10 per message) and have their words transcribed in archival ink onto a quilt square. Sara R along with her sister Ann then stitches up all those words and wishes into permanent and tangible form. It is an astonishing act of beauty, love and healing. 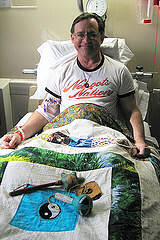 The quilt diary posted just days before paradise50 went into surgery. The messages that people posted in the diary were already bringing healing and care during a time of intense isolation and fear. As Sara R said, The healing begins before the quilt is even begun. The quilt arrived yesterday during another very scary time when p50 has started intense radiation (6 sessions a week) to the head, throat, and chest for 6 weeks, and 2 days before he goes into the hospital for intense 24 hour chemotherapy. Last night we laughed and pointed as we read through the messages and looked at the symbols Sara and Ann had woven into the quilt. Each white square you see below contains a hand-written message from one of you. Sara R talks to the recipient before beginning the quilt to find out what colors they like and what symbols would be meaningful to them. For us the symbols of Otter, Dolphin, Deer and Bear are very significant. 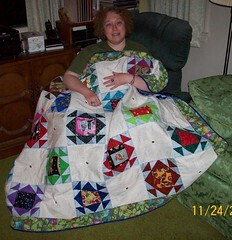 It takes time and material to make these quilts -- if you can help by donating toward these, we are most appreciative. Here is a PayPal link - or message me if you prefer to send a check and need an address. Suggested donation is $10/message -- but if you can help cover messages for others, it would be great. We don't want anyone to think they cannot participate because they can't afford to donate. That being said, all are encouraged to leave a message, donation or no! 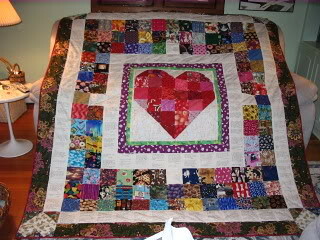 As I think about my quilt the words caring, creativity and comfort come to mind. 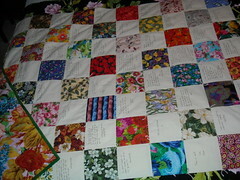 Caring is embodied in the messages written for me by the DKos community and transcribed by Sara onto the quilt blocks. I see familiar names and the words make me smile as they bring feelings of support and moments of wellbeing. As those moments increase, I realize my body and spirit are beginning to heal. The botanical images in the fabrics Sara and Ann chose for the quilt nurture my feelings of creativity... feelings I feared were lost to illness. As I trace the outlines of the twigs in the main blocks, my eyes delight in finding the other images in the fabrics. I see flowers and leaves, grasses and ferns, fruits and vegetables, butterflies and bees, branches and stones, patterns of sky and water, all carefully chosen. I can feel the healing power of nature and the beginning of hope that I will be in my garden again. The careful sewing is a pleasure as well. My fingers follow the stitch lines, my eyes delight in the precise seams, and I smile as I hear Sara’s words describing the sparkly buttons as "a bit of bling for princesspat". My longing to be in my own sewing room is growing, and my resolve deepens to continue to do what I must so I can. The healing process is at work. Quilts have always been a source of fundamental comfort to me. 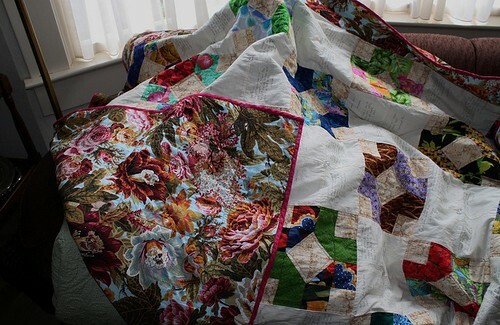 As a child I slept wrapped in the love of my grandmother's quilts. When I married she sent me a Wedding Ring quilt. When my children were born they slept with and were comforted by her quilts, and now their children are as well. The blood clot I am recovering from nearly cost me my life and has severely damaged my leg. Pain, fear, and sorrow have often overwhelmed me. I still must spend most of my day with my legs elevated. But I do so covered by my lovely quilt, and the emotions of love, security and comfort I treasured as a child return to me. 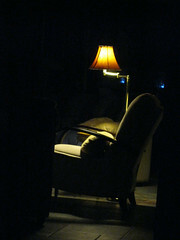 As I rest, the assurance I will find the strength I need to complete the next six months of my recovery program grows. Caring thoughts, the gift of creativity, and a renewal of my deepest sources of strength and comfort are all sewn into my quilt. Thank you. Otteray Scribe:Gaelic: Dh'aithnichinn air do sheirc do thabhartas. English: I would know your gift by your graciousness. My quilt is like a Linus blanket, except I don't drag it behind me on the ground. When my dad had a mild stroke last week, I came home from the hospital late every night and slept on his sofa under my quilt. It was comforting, like being a kid falling asleep with the faint voices of people who love you speaking in another room. ...time and again I have seen people being comforted here, getting quilts, sometimes getting some financial help; they've been so grateful and I've always thought, Oh, well, of course. That's what we do here! And yet, when you are on the receiving end of it, it does not feel like Of course. It feels like Holy $#&%! The emotional impact it has on the recipient cannot really be appreciated if you haven't experienced it. Thank you, Sara and Ann, and everybody. My quilt sustains me. It provides whatever I need at any given time - warmth, comfort when I'm ill or in pain, eye candy, soft arms when nightmares come, Sara's love. When sleep eludes me my fingers reach for the knots so lovingly tied by Ann, and out I go. 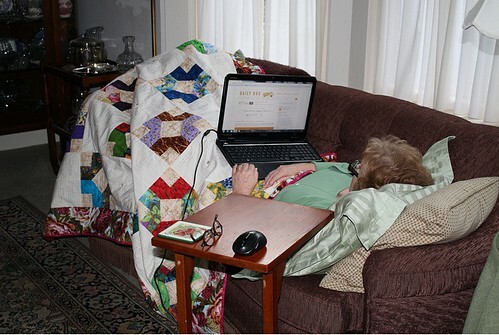 When trouble comes – emergency room visits, GI lab, surgery – my quilt allows me to take the community with me. I read the messages and touch the names; moreover, medical personnel are forced to see me as more than a sick lady in a bed. These quilts are magical, providing strong Kossack medicine, and Sara and Ann are the genies who make it all happen. I love them both. 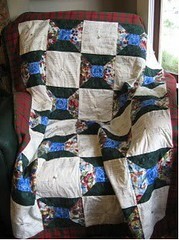 The gift of one of Sara and Ann's quilts is an ongoing gift that changes to fill the needs I have at any given moment. One glance at it reminds me of all the people who care about me - like getting a quick reassuring hug. Reaching for it soothes my heartache and drives out my sorrow. At times my quilt of flowers pops into my mind when I'm faced with a tough task or having a rough day, as though it is giving me a bouquet or reminding me of its power to protect me. This quilt has taught me what a gift it can be to open myself to others, in grief or in joy, as it is equally important to receive the hugs and love and comforting as it is to give it. I am blessed to have this gift and will forever be grateful. I was just talking about my quilt yesterday with a friend and telling her how special it is to me. I keep it next to my bed and use it every day for a nap. I lie down and Frank comes in and pokes my hand with his doggie nose and I lift the quilt up and he climbs up next to me. The meds I take make me dizzy and naps seem to help. And the quilt always seems to know the exact right temperature for me to rest comfortably. The comments from the Daily Kos community are such a comfort as well. I just can't thank you all enough and I want you to know I think about you everyday. Thank you SmileyCreek for asking if I wanted to contribute to your diary. I have not yet had a chance to thank Sara and Ann publicly for their beautiful quilt. My quilt arrived when I was in so much pain from my radiation treatments that my doctors had to change where the radiation was pointed until my Bessie had some time to heal. My radiation ended a month ago, and then I got hit with pneumonia. This week I returned to work while I still recover from pneumonia. When I was asked about a community quilt for me, I was a little hesitant because it's so different to be needing rather than giving support and comfort. My friends helped me. Nurse Kelley helped me see the flip side: When we care for others, we give them a gift, but we also need to be willing to accept the gift of caring when offered to us. Meteor Blades, not a lover of phone chats, supported me with the gift of hours of caring phone conversation with advice, comfort, support and good old-fashioned laughter. I thought about what Kelley said, and how good MB and many other friends made me feel, and realized that my fight against breast cancer would only be made stronger by community support. 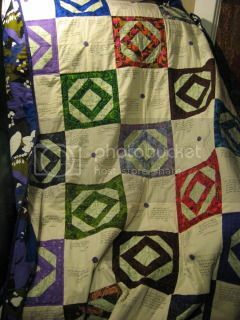 Our DK community surrounded me with healing warmth and love when Sara posted my quilt diary. The messages were so heart-felt that I could FEEL each person's support as I read their words, which I will forever treasure with honor and gratitude. 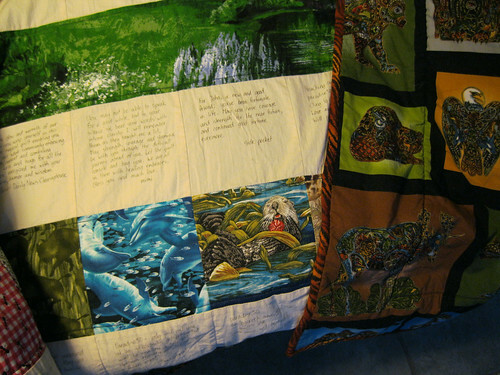 Sara's and Ann's quilts are a piece of artwork, sewn with love. When I wrap myself in my quilt, there is a magical feeling of community love and energy. The quilt is not just beautiful, but it also feels so good. Sara and Ann took the time to help me find just the right fabric for the backing: abstract flowers with all my favorite colors! It took me hours of looking at fabrics because I wanted to make sure my choice would be just right for the incredible messages sent from our community. The Community Quilt Project is one of the best projects at Daily Kos. Let's help sustain this gift to our community by remembering to donate, when we can. Helping and supporting each other at Daily Kos is what we do best.